It's like funky shirt but way better. 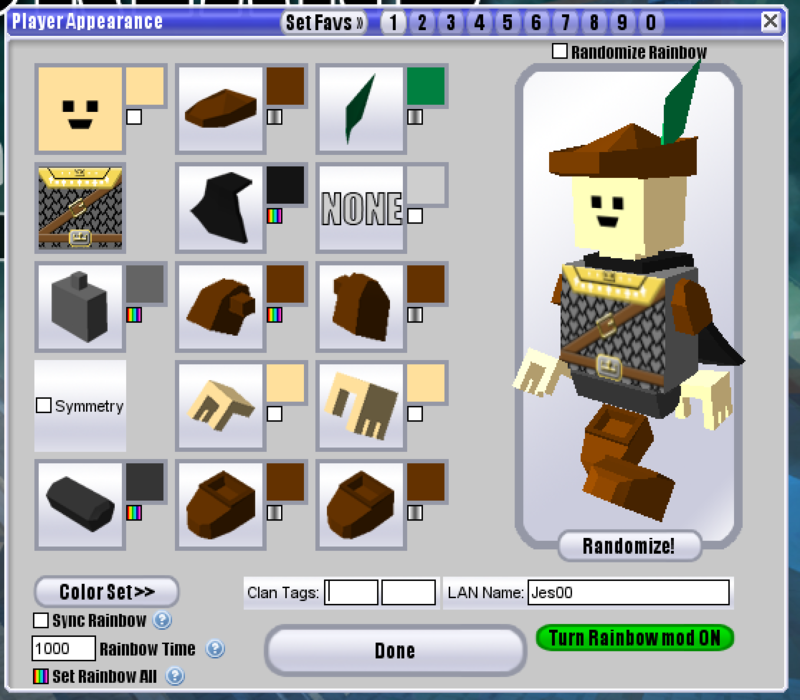 Select individual parts of your avatar to be rainbow or greyscale. Sync rainbow/greyscale colors with each other. Set how fast your color changes. Works with symmetry or without. Turn it on with a keybind or in the avatar window. so we can assume it doesn't lag servers? Does this one go through the spectrum and not change colors every 0.5 seconds? There's a one second minimum because Badspot added it in v13. Because of this, I made it just do a random color of the rainbow instead of gradually going through shades of colors, because that was slow and tedious. doesnt seem to turn off properly. it says its turning off but it doesnt actually stop changing colors. upon further experimentation it only seems to occur when im the host? I've tried a variety of things and have been unable to replicate the bug. Maybe you have some sort of conflicting mod? You can set rainbow time to 4001 to avoid the kicking script on servers that have it. thank you for improving the old rainbow mod by making a better one. Pretty much. It was useful when everyone was on Pentium 4's and Core2's but the average computer is like 5x faster since 2010.